Once a Blondie, Always a Blondie! Can y'all believe NYE is coming up in just a few days?! I have soooo enjoyed this past week with my sweet fiancé, right before school starts back next week. We have been busy spending time with friends, family, each other, and then wedding planning in our spare time! I am SO ready for 2017!!! So right before Christmas, I stopped into Hollister to look for a Christmas gift for my niece. 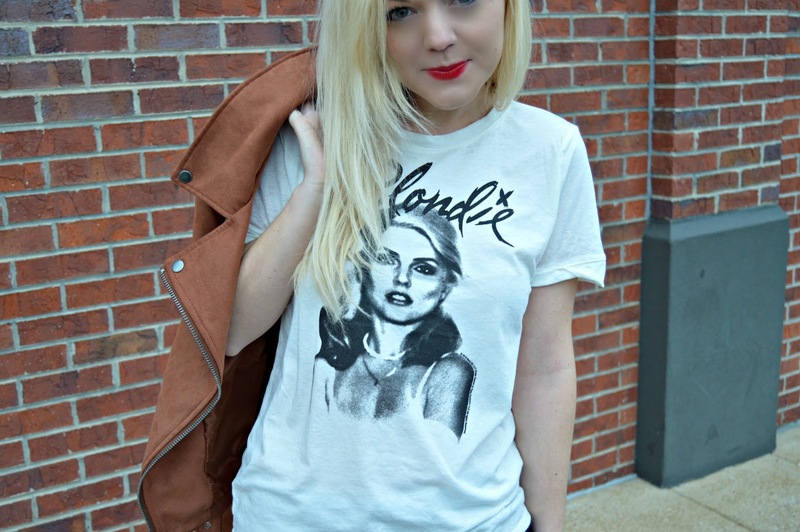 As I was browsing, this Blondie t-shirt caught my eye. I looked at the price tag, and it was an instant "duh. I have to have this!" moment (anyone else have internal dialogues with themselves when they go shopping? 😂 ). Hollister brings back many middle school memories for me, but I'm going to be completely honest with you, they STILL have super cute things that have stood the test of time. I mean let's be honest, graphic t's are SO classic: they never go out of style!! After I got home from this shopping trip, I sent a pic of this t-shirt to my Mom and said "doesn't it look like Barbie?!" 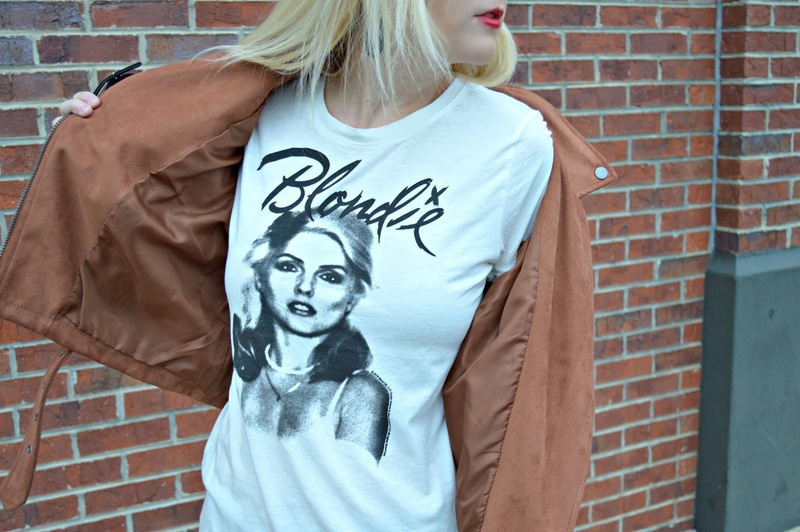 She replied that she loved it, then proceeded to inform me that Blondie is a band.....crickets....yeah I didn't know that when I bought this shirt...but being that I'm blonde & love graphic t's, I bought it anyway! 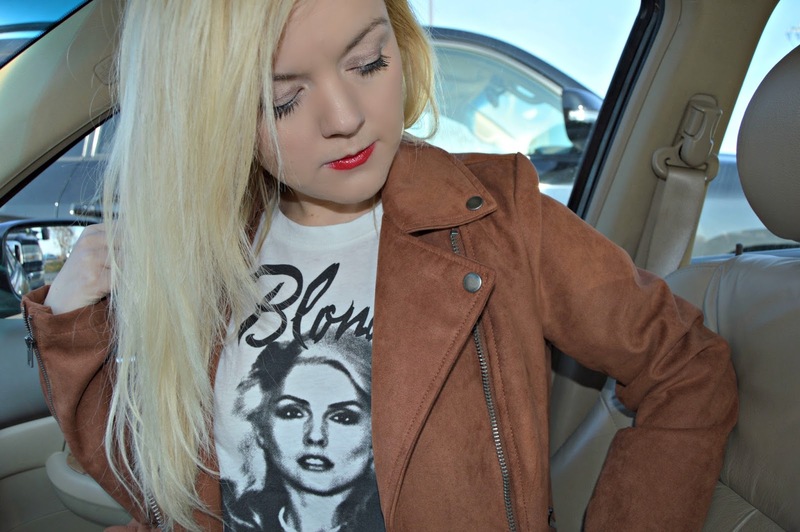 I paired my graphic t-shirt with my brown moto jacket from F21, that I originally blogged about HERE in my "Dressing Room Diaries." Oh my gosh, talk about obsession. And right now, this jacket is only $25. Trust me, you need it. 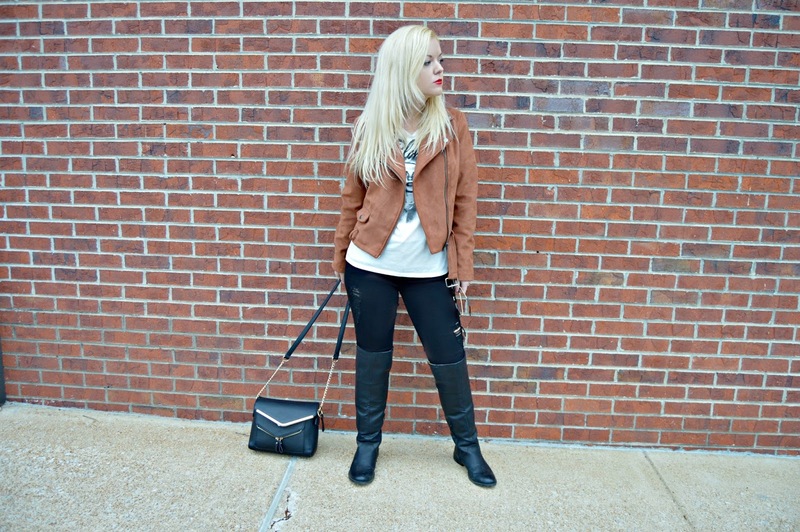 I am a firm believer that you can look super stylish on a budget!!! Lol!!! Too funny Ashley! I love the entire look. Aw thank you so much Rachel!!! :) Leave it to Momma to teach me a thing or two. Lol, love that woman & her wisdom! Love ya! A Super Fab December Giveaway!